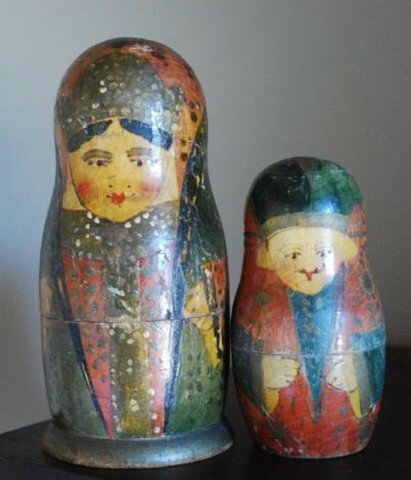 Russian Boyar Maiden & Son, circa 1920s. Beautiful detail and smells old. The maiden (7 1/4" tall) has a crack in the wood that goes from the top part of the bottom to underneath. They have scratches and paint chips all over them. The small nesting doll (5") has a slot cut out of the top - it looks like to put money in it. Even with all these flaws, they display well. This style of Boyar is rare and very old. Previous owner found them at a local estate sale in Canton, Missouri. Crazing, chipping of paint, dents, crack in bottom of main doll and piggy bank slit made to top of male doll. Wood burned facial features, no stamp, wood smells very old.